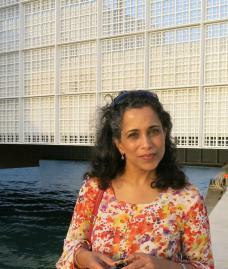 Kishwar Rizvi is Professor of Islamic Art and Architecture at Yale University. Her recent publications include The Transnational Mosque: Architecture and Historical Memory in the Contemporary Middle East (University of North Carolina Press, 2015), for which she was selected as a Carnegie Foundation Scholar, and Emotion, and Subjectivity in Early Modern Muslim Empires: New studies in Ottoman, Safavid, and Mughal art and culture, editor, (Brill, 2017). Her earlier publications include The Safavid Dynastic Shrine: History, religion and architecture in early modern Iran (British Institute for Persian Studies, I. B. Tauris, 2011) and the anthology, Modernism and the Middle East: Architecture and politics in the twentieth century (University of Washington Press, 2008), which was awarded a Graham Foundation publication grant. Professor Rizvi’s fieldwork includes research in several parts of the Middle East, including Turkey, Saudi Arabia, Iran, and the United Arab Emirates. Current projects include research on contemporary museums in the Gulf as well as a new book on the Safavid ruler, Shah Abbas, and global early modernity. Kishwar Rizvi teaches undergraduate introductory surveys on Islamic art and architecture, as well as seminars on art historical methods, the representations of kingship, and art and politics within a transnational context. Her courses focus on modern and contemporary architecture in the Middle East; the global Renaissance; Ottoman, Safavid and Mughal art and architecture; on the intersection between painting and poetry in Persianate art; and on the artistic, cultural, and political significance of illustrated travel literature in Europe and the Middle East from the medieval period to the present. A note to prospective graduate students: I encourage you to reach out to me if you have specific questions about studying Islamic art and architecture at Yale University. While is often useful to plan a visit to the campus and to meet with students and the faculty in the department, international students need not feel compelled to do so. Many questions can be answered via email by the Director of Graduate Studies or myself. The Safavid Dynastic Shrine: Architecture, religion and power in early modern Iran, (London: British Institute for Persian Studies, I. B. Tauris) 2011. Modernism and the Middle East: Architecture and politics in the twentieth century, editor, Studies in Modernity and National identity Series (Seattle: University of Washington Press) 2008. “Between the Human and the Divine: Majālis al-Ushhāq and the materiality of love in early Safavid art,” in Ut pictura amor: The Reflexive Imagery of Love in Artistic Theory and Practice, 1400-1700, edited by Walter Melion, Joanna Woodall, and Michael Zell (Leiden: Brill), 2017. “The Incarnate Shrine: Commemorating the cult of Shi‛i imams in Safavid Iran,” in Saints and Sacred Matter: The cult of relics in Byzantium and beyond,” edited by Cynthia Hahn and Holger Klein, (Washington, DC: Dumbarton Oaks), 2015. “Transnational Architecture, Ethics, and the Reification of History: Park51 Islamic Community Center in New York City” in In the Wake of the Global Turn: Propositions for an ‘Exploded’ Art History without Borders, edited by Aruna D’Souza and Jill Casid, (Williamstown, MA: Clark Art Institute), 2013. “Architecture and the Representations of Kingship during the reign of the Safavid Shah Abbas I,” in Every Inch a King: From Alexander to the King of Kings, eds. Charles Melville and Lynette Mitchell (Leiden: Brill) 2012. “The Suggestive Portrait of Shah ‘Abbas: Prayer and likeness in a 1605 Safavid Shahnama (Book of Kings),” The Art Bulletin 94/2, (June, 2012): 226-250. “Persian Pictures: Artifice and authenticity in representations of Islam in the early 18th century,” in The First Global Vision of Religion: Bernard Picart’s Religious Ceremonies and Customs of All the Peoples of the World, eds. Lynn Hunt, Margaret Jacob and Wijnand Mijnhardt, (Getty Research Institute), 2010. “Art,” Key Themes for the Study of Islam, ed. Jamal Elias, (Oxford: One World Press), 2010. “Modern Architecture and the Middle East: The burdens of representation,” introductory chapter in Modernism and the Middle East: Architecture and politics in the twentieth century, eds. S. Isenstadt and K. Rizvi (University of Washington Press), 2008. “Art History and the Nation: Arthur Upham Pope and the discourses on „Persian Art‟ in the early 20th century,” in proceedings of the symposium Historiography and Ideology: Writing the history of the Ottoman architectural heritage, guest editors, Sibel Bozdogan and Gulru Necipoglu, Muqarnas: Journal of Islamic Art and Architecture, vol. 24, (2007). “Religious Icon and National Symbol: The Tomb of Ayatollah Khomeini in Iran,” Muqarnas: Journal of Islamic Art and Architecture, vol. 20, (2003).